To understand using options and futures to manage currency risk; to understand options trading strategies. Financial markets have become increasingly global and the need to manage exchange rate risk has become increasingly important. Trading case XR1 introduces you to using some of the tools and trading strategies that get employed in the field. See the appendix to this case for Trading Tips on this case. In this market you are a price-taker. That is, you can trade options and a future at the current available price. You have, however, some additional private information that has not been incorporated into the available derivative prices. Your information is that you know for sure that at some time during the trading trial the exchange rate will take a significant "jump." However, the magnitude, direction and timing of the jump is random. In addition, once a jump is realized it is possible that additional independent jumps can occur. In the XR1 trading exercise your objective is to make money. As a result, you should think through what type of option trading strategies can best exploit your knowledge of how the trading period will unfold. If at any time you want “lock in” trading gains you can always manage the delta of your position to try and do this. For example, a delta neutral position manages the exposure of your position to changes in the underlying exchange rate. As a trader, your performance is measured in terms of how well you use this information for trading, relative to all other FTS traders. Each trader's screen will monitor the following markets: the spot exchange rate (S) for a basket of foreign currencies (bfx). In particular, the exchange rate is 500 units of the basket (bfx) for x units of USD, where x will fluctuate in line with the spot exchange rates. The default free US treasury strip with 2 years remaining to maturity at the start of the trading period, European call and put options on the exchange rate for two different strike prices, an exchange rate futures market, and a cash money market. One trial in this case is almost 12 months, but time is condensed so that two weeks is equal to “n” seconds. That is, throughout the trial trading is continuous but prices will change in discrete time, two week steps every “n” seconds of FTS time. That is, in calendar time the markets are open for FTS traders on the first trading day of every two weeks. Note: In the default form of the case “n” seconds equals 20. New prices are realized for each trading Day (20 second interval). Prices reflect the underlying difference in calendar time. That is, the Treasury Strip appreciates toward its face value over time, and option prices reflect the time left to maturity etc. The projected volatility is a little above historical averages for volatility but well below the heights reached in the European currency crisis in 1992. Two weekly bid and ask realizations for the spot exchange rate are updated every 20 seconds on the FTS trading screen. The size of the spread in this market is stochastic. At the end of the year ( = one trading trial), your currency position is marked-to-market at the prevailing rate. The second security market is a risk-free US treasury strip that pays $1000 at the end of 2 years regardless of which path the equity markets take. At the time of each trading day the price of this security equals the present value of the face amount discounted at the risk-free rate over the remaining time left to maturity. As a result, note that a long position in the strip market is equivalent to lending at the risk-free rate whereas a short position in this security is equivalent to borrowing at the risk-free rate. Securities 3 through 6 are European currency options (put and call) defined on the underlying spot exchange rate. The strike or exercise prices for these options are 290 and 310 (in $US). That is, the call option with a strike price equal to 290 provides its owner with the right, but not obligation, to acquire 500 bfx for $US290 at the end of its life. The time to maturity for each option in the FTS markets is initially 1 year and declines every second until the options expire. At the end of their life options are automatically exercised if they are "in the money." Finally, the seventh market is a currency market future. This contract is an obligation to deliver 500 bfx in 52 weeks time. You are not permitted to trade directly in the spot x-rate market. In this case FTS traders are market takers who face a stochastic bid/ask spread for each security. The mean of this spread approximately coincides with theoretical prices (ignoring your private information). However, the range around the theoretical price increases as we move from Treasury strips, exchange rates, exchange rate futures, call options, to put options. That is, on average the spread is the largest for currency put options and smallest for the Treasury strips. You cannot trade the exchange rate. You cannot trade the option you have a starting position in. That is, Type A cannot trade the Call 290 and Type B cannot trade the Put 290 above. 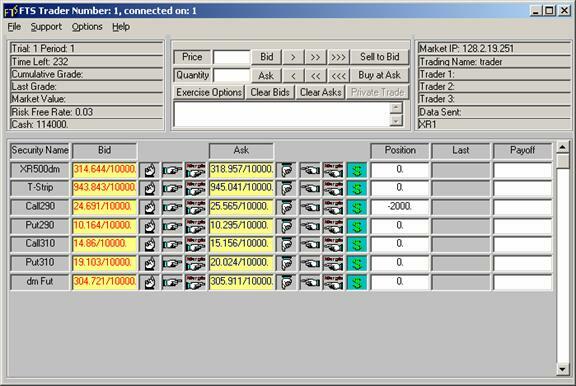 You cannot trade lot sizes that exceed 10000 units. However, over time any quantity can be traded at the prevailing spot price by trading multiple lots. You can shortsell securities or borrow cash at the prevailing interest rate to purchase additional securities if you are short cash. Any cash shortfall/surplus automatically earns the prevailing rate of interest. The risk-free rate of interest is 3% per annum (continuously compounded and marked each 20 seconds (two weeks)). Your trading objective is to earn as much grade cash as possible. The upper and lower bounds for market cash are -$100 million and +$100 million. Outside of these bounds no further Grade cash is earned or lost. Trading is conducted over a number of independent trials and a record of your cumulative grade cash is maintained. 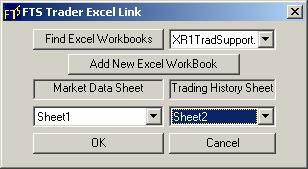 Download the trading support spreadsheet from the Virtual Classroom page and open it in Excel. In trading case XR1 you are a short term “news trader.” You have information that lets you form a “market view” about the short term price behavior of the underlying exchange rate. In XR1 the price of the underlying exchange follows the geometric Brownian motion process assumed by Black and Scholes with one important difference. During the trading period at least one significant economic news event will occur that will result in the price of the exchange rate taking a jump. However, you do not know when the jump will take place or it’s magnitude and direction. In addition, there may be more than one significant jump (but there will be at least one). Unlike the real world you do not face any liquidity or capital constraints. You have an initial position in an option that you cannot trade, but you can trade the remaining derivatives (option and futures). As a result, your task is to manage your trading strategy so that it makes money if your view of the market is correct. At any time if you want to lock in your trading gains you can also manage the delta of your position. By linking to the XR1 support spreadsheet (you can download this from the Virtual Classroom page immediately below where you download the FTS Trader from). Delta is a measure of the dollar sensitivity of your position to changes in the underlying (i.e., the exchange rate). Formally, the delta of a derivative security is the partial derivative (i.e., calculus) of the derivative security’s price w.r.t. a change in the underlying asset price. The delta of each security and your position’s delta are provided in the support spreadsheet in real time. 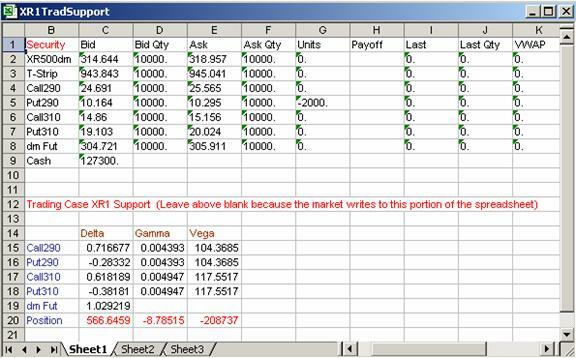 Excel Note for FTS Trader: If Excel is set to Automatic Calculate (Tools, Options, Calculations, Automatic) and you link FTS Trader to this spreadsheet, it will automatically recalculate your position delta whenever the exchange rate changes in XR1. By trading the options and futures you can manage your position delta to be approximately zero, positive or negative. For the case of a zero position delta your position’s value will be relatively insensitive to shifts in the underlying exchange rate. If you assume a large positive position delta your position will be very sensitive to shifts in the price of the underlying (with increasing sensitivity the larger your position delta is). That is, if the underlying exchange rate increases so does your position’s value and if the underlying exchange rate decreases your position value will decline. Finally, if you assume a large negative position delta then the value of your position responds in the opposite way to the change in the exchange rate. That is, if the exchange rate increases your position’s value decreases and vice versa. Finer points: Your position gamma is a measure of how sensitivity your position delta is to changes in the underlying. Formally, gamma is the partial derivative (in calculus) of the derivative security’s delta w.r.t. the underlying asset price (i.e., the second partial derivative w.r.t. the underlying asset price). In the field, suppose a dealer is hedging the exchange rate risk by maintaining an approximate delta neutral exposure (i.e., position delta equals 0). If a dealer maintains a gamma sensitive (i.e., large position gamma) position they must adjust delta frequently and by larger amounts to maintain a zero position delta. If a dealer maintains a gamma insensitive position (i.e., approximately zero position gamma) then this reduces the frequency and size of delta adjustments that need to be made to maintain a zero position delta. In practice by reducing the size and frequency of having to adjust your position’s delta results in a source of significant transaction cost savings. Finally, your position Vega is a measure of how sensitive your position is to volatility.